I grew up in a house with a lawn big enough to necessitate a riding mower. Of course, this meant that I found myself at a loss when I moved into our current house. The lawn is barely big enough to fit two riding mowers side by side. Shopping for a new lawn mower meant research and a lot of trips to the local hardware and landscaping store. More than that, however, it meant wading into the debate between the electric lawn mower and the gas powered lawn mower. Let's explore the most important factors in helping you choose the right mower for your lawn. The most basic of reasoning says that a big lawn means a riding mower and that a small lawn means something small enough to fit on your lawn. There are more accurate ways to measure, though. Electric mowers are limited by battery capacity or cord length, so they work best on a lawn up to ¼ to ⅓ of an acre. Corded mowers offer great power, but can be a real pain when it comes to navigating obstacles. Battery-powered mowers are much more convenient in these circumstances. They have come a LONG way in recent years with the introduction of lithium-ion batteries. They're not as powerful as a gas mower, but come pretty close. A gas powered push mower, by comparison, can easily manage a ½ acre lawn and will easily navigate obstacles. If your yard has hills you might consider a self-propelled model. Generally, a riding mower is ideal for any lawn over ½ of an acre, as it manages much larger swathes of terrain more efficiently. They’re quick as well, which is a lifesaver when you’re trying to get a mowing in during that pre-rain humidity in the peak of summer. Different regions use different kinds of grass on their lawns. Shocking, no? Yet it was something I had never considered when picking out a mower. For one thing, a thicker grass requires more power to cut. An electric lawn mower might not have trouble with Fine Fescue, for example, but if you’re trying to cut a thicker, coarser breed like St. Augustine, it may be wiser to keep to a gas powered lawn mower. Generally speaking, grasses grown in southern or more humid climates will be more difficult for an electric mower to handle. If you’re in a transition zone or northern zone, you may have more luck. Be sure to check with your local lawn care center to be sure, though (read more about grass types here). Another important consideration when looking at grass types is how quickly they grow and, therefore, how frequently you’ll need to mow. 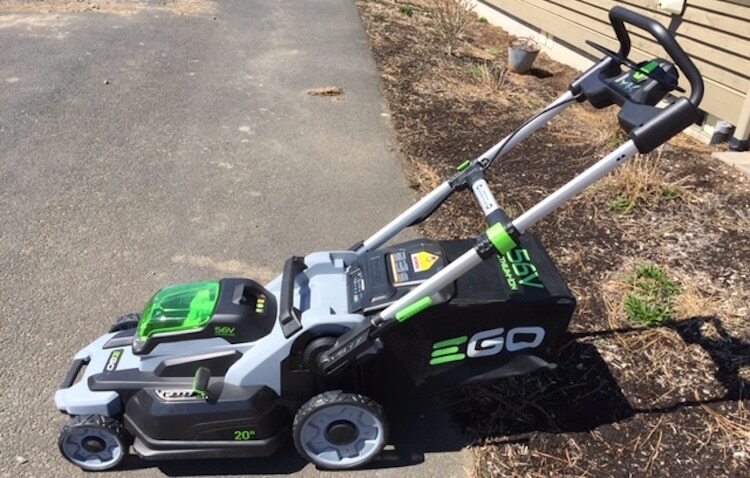 If you have bad luck with getting gas mowers to start and have a lawn of quick-growing ryegrass, it may be easier to keep your electric mower charged regularly and get going every week with the press of a button. If you have a smaller yard, a battery-powered mower is a great solution. There are a number of reasons for this. Electric mowers, for example, are quieter than gas mowers. To get an idea of how quiet, think of the difference between a single car going by on the highway compared to the sound of busy traffic. Your neighbors will be grateful for the difference, especially if you like to mow earlier in the morning. Electric mowers require less maintenance than gas mowers. There are no spark plugs, no emergency runs for more gasoline, and far less of a need for messy oil changes (something I remember all too well growing up!). They end up costing less in the long run, even if they have a higher upfront cost. There’s a lot of variety in electric mowers nowadays. Corded options are still available for small, compact yards, but batteries have grown both stronger and smaller in recent years. A cordless mower can last an hour of yard work, and recharge in as little as 30 minutes. Some brands of cordless mowers have batteries that can be used in other landscaping equipment from the same brand, as well. As a fan of versatility, this is a major selling point for me; it means I can keep multiple batteries charging at any given time and do a quick swap if I happen to run out of juice. Self-propelled electric mowers are available for more hilly terrain, but these tend to eat up battery more quickly. If you have multiple batteries for your mower, however, this shouldn’t be too much of a problem. Some mowers come with multiple batteries for exactly this kind of situation. You can charge one while using the other, allowing your to make quick stops and then keep on mowing. However, there are some drawbacks to electric mowers. Their power output is limited by their batteries, which means they aren’t able to handle thicker grasses or wet environments nearly as well. This means that certain regions are simply not suited to electric mowers, such as more southern climates. It also means you’ll have to know your grass type before purchasing, which can require a trip to your local landscaping shop with a sample of your turf in hand. If you'd like to learn more about electric mowers check out this article. While the lower end of this range may find some use for an electric mower, yards between ¼ and ½ an acre are usually best managed with gas mowers. There are some electric models such as the Yard Force which offer enough juice to mow a half acre or more. Without limiting factors such as running time or battery output, the traditional gas mower can manage any grass type with ease. They’re usually cheaper upfront than electric mowers, with more readily available parts for maintenance and more resources and professionals available for repairs. Along with smaller but more frequent maintenance costs, gas mowers have a large number of variants. Self-propelled gas mowers, for example, are a great option for hilly yards or those who have trouble with the amount of effort required to mow. While there are self-propelled electric mowers, these require larger batteries and have a shorter run-time. Gas powered mowers are able to remain a bit more lightweight without sacrificing usage time. Since a little bit of gas goes a long way, gas mowers are efficient over larger swaths of lawn. There’s no need to pause in the middle of mowing to swap out a battery, and no room for forgetting to charge the battery after the last time it was used. Gas mowers also tend to be more durable than electric mowers, especially if you’re familiar with how to maintain them. A little bit of work can go a long way, though the older the mower, the harder it can be to start it up. While gas mowers create more emissions, many newer mowers minimize these, and a properly maintained mower will have a low emissions output. Electric mowers may not generate any emissions themselves, but they draw electricity, often from coal-powered sources. If you’re concerned about environmental impact, it’s important to consider the pros and cons of both options to make a sound decision for your position. In the end, a gas push mower or gas self-propelled mower is the best option for larger yards under ½ an acre, hilly yards, or yards with thick, coarse grass. A yard larger than ½ an acre is an investment. To get it mowed efficiently, a riding mower is your best option. Riding mowers handle large spaces quickly. They come in two main varieties: lawn tractors and zero-turn-radius (ZTR) mowers. Lawn tractors are the traditional kind of riding mower. They operate with a steering wheel and are able to handle any lawn size, from ½ an acre to over 2 acres. Their higher-powered variant, the garden tractor, is ideal for anything over 2 acres. If you have a hilly or uneven yard, the lawn tractor is your safest and most efficient option. These mowers have strong mowers that can manage going uphill easily, and keep both wheels firmly on the ground for maximum traction while going downhill. Lawn and garden tractors also have a wide range of attachments they can be used with, from clippings collection to hoeing. Some even manage to plow light amounts of snowfall. Never use an attachment while mowing hills, as they change the weight distribution and can lead to the tractor tipping over. The ZTR mower is ideal for a flat lawn or a lawn with obstacles. They’re powered by the rear wheels, while their front wheels are on casters, allowing for a wide range of turns at sharp angles. Steering involves lap bars instead of the traditional steering wheel, which may take some getting used to. Once learned, however, a ZTR mower lets you make quick work of garden edges, landscaping, and trimming around trees. ZTR mowers should not be used on hilly terrain, as they tend to get dangerously unmanageable when going down an incline greater than 10 degrees. ZTR mowers have speed options specifically for open areas. If you’re not looking for a versatile mower, and have no special needs as far as terrain and landscaping are concerned, a ZTR mower may suit your needs better. Choosing the best type of mower for your yard requires consideration of both the kinds of grasses in your yard and the size of your yard. While an electric lawn mower is a great solution for a yard smaller than ¼ of an acre or for tightly-packed neighborhoods, such mowers are limited to thinner, lighter grasses and relatively flat terrain. Gas mowers, while requiring more maintenance, have the power needed for consistent results over larger yards, coarser grasses, or more hilly terrain. For those who have yards over ½ an acre, how hilly your yard is – or how much landscaping you need to do – will dictate whether you need a lawn tractor or a ZTR mower.